UPDATE: Deterioration of the detour path has meant people are advised to choose a different route. See updated story here. Timber felling operations in Glen Clova will affect access to the Kilbo Path this summer and autumn. 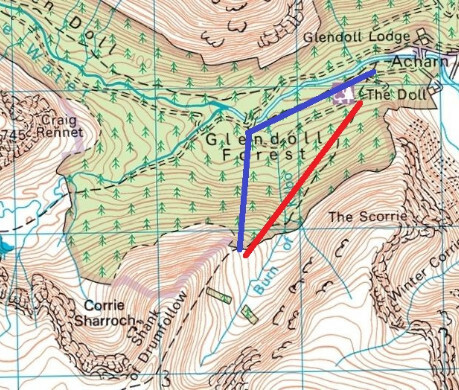 The Kilbo Path, which goes up through forestry plantation from opposite Glen Doll Lodge and climbs the Shank of Drumfollow, is popularly used as an ascent to or descent from the Munros Mayar and Dreish. Felling operations in the plantation are due to start week beginning 6th August and will continue for approximately two to three months, with haulage operations continuing possibly until Christmas. Initially there will be a single harvesting machine working at a safe distance from the Kilbo Path, and walkers will be able to use the path as normal. However as the cutting progresses the contractors will need to close the path for safety reasons. This will happen about two to four weeks from the start of work. A diversion will be put in place and signposted, breaking away at the lower end of the path and following closer to the White Water, before heading uphill to join the main path where it leaves the forest and heads up the Shank. The diversion will be in place until the whole of the timber has been felled and extracted from the area to the south of the Kilbo path, and within a safe working distance to the north of the path. This will take another two to four weeks. Forestry Commission Scotland is making efforts to keep the closure period to a minimum, but says the time taken is dependent on the nature of the terrain and on time lost to breakdowns or bad weather. Regardless of this access takers will be able to access the hills as normal, be it on the Kilbo Path or on the proposed diversion route. Forestry Commission Scotland says the diversion route is steep, earthy and rooty, particularly in the upper reaches, and may be slippery when descending. During the period of the work and timber extraction walkers should be aware that heavy machinery will be working in the vicinity and should keep a safe distance and comply with any signs or instructions.